Just for a little fun, what do you think Pablo & Jonah are really talking about? 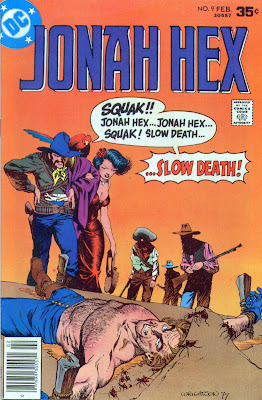 Jonah Hex #11 "The Holdout!" The story opens with Jonah in a saloon casually watching a poker game at a nearby table. One man comments that he is cleaned out & gets up to leave. The remaining players ask Jonah if he would like to sit in on the game. Jonah states that his father always told him to stay out of crooked poker games and then he dumps a beer on the head of the dealer. The guy leaving the table protests that the dealer hasn't even been winning. Jonah points out that the other two men have been doing all the winning and then grabs the dealer's arm, revealing a gizmo called a holdout that allows the dealer to keep a card up his sleeve and then pop it into his hand when he needs it. Jonah tells the man that lost the game to pick up his money and leave, he also asks if there is an undertaker in town. The man says that there is and Jonah says that the undertaker needs to get three coffins ready. The man heads out of the saloon. Three men involved in the poker game start to draw on Hex, but one of them realizes who Jonah is and he backs out of the gunfight. The other two draw on Jonah and Jonah shoots them dead. Now this is the confusing part. There were three men involved in cheating in the card game and the dealer was wearing blue. Three men started to draw on Hex, one backed out and Jonah shoots two men dead, one of them wearing blue. Turn the page & what do we see? Jonah holding a gun on the dealer, who is alive & wearing a blue suit. This was pretty sloppy visual storytelling. (& it wouldn't have happened if Lopez was doing the art). Jonah takes the holdout from the dealer and leaves. and beating the snot out of Preston. When he is done Jonah turns to be sure the woman is okay and learns that it is none other than Joanna Mosby! Then he gets smashed in the head with a 2x4. A black man, Lupo, is standing over Jonah and asks Preston if he wants Hex killed. Preston has Lupo drag Jonah over to a hitching post. They tie Jonah's arms out to his sides and then, using a nine-pound sledgehammer, they smash both of Jonah's hands. Preston tells Joanna that he will be gone to Abilene for three weeks. If Jonah is still in town when he gets back, Preston & his men will kill Jonah. the hand would heal abnormally, possible with some loss of function. People can function with broken hands and fingers surprisingly well. definitely be some bad arthritis in the future. The doctor leaves Joanna & Jonah alone. She explains that she has been following for months, wanting to explain how she was hoodwinked by the Chameleon. Jonah tells her to forget it & put out the lamp, he needs his rest. Joanna douses the lamp and she approaches Jonah's bed. He says that he won't be able to hold her and she replies by kissing him deeply. The next day Joanna comes into the room having returned from the store. Jonah has torn off the ends of his bandages so that he can use his fingertips. He is toying with the holdout. 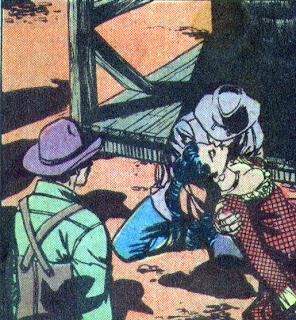 Jonah asks Joanna to help him get dressed and he borrows her small derringer. Jonah then rides quite a ways from town and starts target practicing with the derringer in the holdout. Whenever he squeezes his arm to his side, the holdout springs down his sleeve, placing the small pistol in his hand. He can then squeeze the trigger with his fingertips. How tough is Jonah? 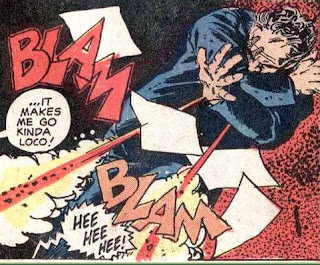 Well, his hands are mangled, he is using a gizmo to toss a pistol down his sleeve, he is using a very inaccurate derringer so he decides to practice LEFT HANDED!!! He literally practices for weeks, riding out at dawn, back in at night. Finally he can snuff candles at about 6 feet. He never tells Joanna what he is doing since she betrayed him once before. Several days later Preston comes back to town. Talking to Sleeze & Lupo he learns that Jonah is still in town, even though he leaves every day. Preston tells the two thugs to follow Jonah out of town and kill him. Sleeze & Lupo decide to take the easy way and the next morning they just meet Jonah on the edge of town. They draw and start mocking Jonah with his broken hands. Suddenly the derringer pops down his sleeve & he plants a bullet in Sleeze's brain and one in Lupo's heart. Who's laughing now,, laughing boys? Preston is in the general store telling the store owner about Sleeze & Lupo going to kill Jonah. Joanna is shopping and overhears the talk. A man runs in the store and tells Preston that Jonah is in the saloon looking to kill Preston. Preston draws his pistol and heads across the street. Joanna grabs a shotgun off the wall and heads out behind him. Preston is standing in front of the saloon and calls Jonah out. Jonah holds her a moment longer, kissing her cold dead lips, and then carries her off down the street. Timeline - There is no mention of Jonah being a wanted man but this does take place several months after issue #4 where he ran into Joanna Mosby, therefore he is still a hunted man. So this one must take place somewhere around 1876-77. I didn't care much for this issue, the artwork was ok but the story was very pedestrian. Jonah getting his hands broken was a good idea, but I didn't believe how quickly he could recover or use his fingers. 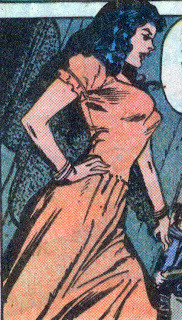 Joanna Mosby was a great character but I would have rather seen her used across two issues and having the reader try to guess if she would backstab Jonah again this time. A good character wasted in my opinion. Next Issue: - Pole-fighting, Gator fighting, and the swamp with the highest elevation in the world when Jonah takes on The Search for Gator Hawes!!!! 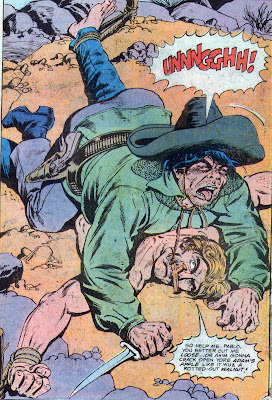 Jonah Hex #10 "Violence at Vera Cruz"
Jonah has just killed Pablo and is getting to ride away and one of El Papagayo's men has Jonah dead in his sights. Just as the henchman is about to pull the trigger, Papagayo stops him, reminding him of the letter that they found in Jonah's saddlebag. The letter is from Mexican President Diaz authorizing the commander of the fort at Vera Cruz to turn over the treasure of Carlota to Jonha and a band of Mexican soldiers. Papagayo says that only a crazy man would kill the goose that lays the golden eggs. 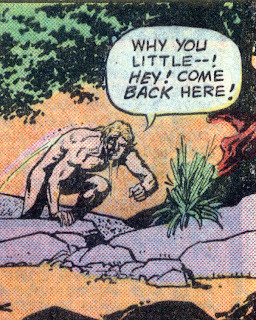 But...isn't that exactly what Papagayo tried to do last issue when he tied Jonah to an ant hill? Noooo, not Papagayo! He and Jonah are old friends and he just wanted to teach Jonah a lesson not to mess with an old friend. Also, Pablo was a stinking pig and Papagayo didn't have the heart to kill his brother-in-law, Pablo, so he set it up so that his good friend Jonah would do it for him. If you believe THAT, I know of some swampland in the Oklahoma panhandle that's for sale. ANYWAY!!!!... Jonah and the Mexican troops continue on to Vera Cruz with Papagayo and his men following. 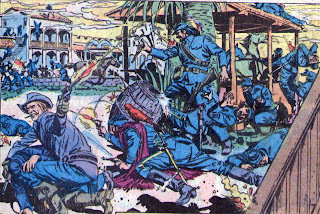 Eventually Papagayo springs an ambush, killing all of the Mexican soldiers. His men strip the soldiers of their uniforms and dress up as the soldiers. They take everything, including a beautiful ivory-handled pistol inlaid with gold. Now Jonah and the fake Mexican army are headed for Vera Cruz. Ten days later, hex & company ride into the fort and deliver the letter to Gen. Rumolo. Rumolo & his lieutenant guide Jonah & Papagayo to the treasure while the rest of the bandits are treated to dinner. The General informs them that the treasure of gold ingots is worth five million dollars (about 88.6 today). Suddenly a corporal runs in shouting that there is a fight in the fort. They hurry out into the courtyard to find Lt. Lopez beating the living tar out of one of Papagayo's men. Lopez explains that his opponent is carrying an ivory-handled pistol inlaid with gold, exactly like the pistol that Lopez has. these pistols were a gift from Rumolo himself to Lopez and his brother when they served under Rumolo in Sonora. Papagayo's henchman claims that he purchased it, but Rumolo knows that Lopez's brother would never have parted with the pistol willingly. He declares the henchman a thief and to be taken and shot. The henchman panics and shouts "Papagayo!! Don't let them shoot me!" Needless to say, that's when all hell breaks loose. With each side taking cover on opposite sides of the courtyard, a fierce battle ensues, but Jonah, Papagayo & his men are outnumbered and overwhelmed. Rumolo announces that they will all be shot at dawn. Jonah protests and gets a riflebutt to the head. Jonah comes to in a cell with Papagayo. Just then an old woman with a parrot on her shoulder shows up, bringing a basket of food for the prisoners. The soldier guarding the cell tells the shawl-covered woman to leave, but she pulls a dagger and stabs the guard to death. She unlocks the cell and reveals herself to be Estrellita and, of course, the parrot is Pepito, sent by Papagayo to her with a note explaining what she was to do. She frees the rest of the men and they get ready to make their escape. Rumolo is awakened by an explosion. Hex and the bandits have gotten into the munitions shed and while the gold is being loaded into a wagon, dynamite is being tossed at the Mexican Army to hold them at bay. Eventually the wagon with the gold, Hex, Papagayo, & Estrellita gets out of the fort and makes a getaway. They travel for quite a ways until they come to a broken bridge. The bridge, supported by ropes and made of slats, has snapped from their side of the canyon and it dangles from the opposite wall of the canyon. 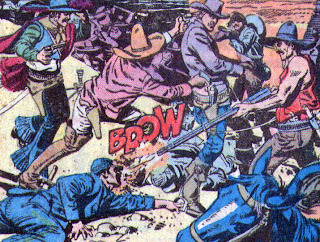 Papagayo pulls a pistol on Hex and forces him to fix the bridge. Jonah takes a rope and manages to toss a lasso around a tree limb on the far side of the canyon. He is going to swing over, with a rope tied to his waist and then tie that rope to the bridge, allowing the henchmen to pull the bridge up to their side of the canyon. But the tree limb breaks and Jonah falls into the canyon, grabbing the end of the bridge at the last second. Papagayo's men then pull Jonah and the bridge to safety. Finally the bridge is repaired but Jonah notes that it can't hold the weight of the gold-filled wagon. Papagayo orders the men to unhitch the horses and unload the wagon. They walk the horses across and transport the gold bar by bar. They are down to the few remaining bars and the wagon. All of Papagayo's men are on the bridge when he tells them that they can keep the remaining gold to themselves and then he slices the ropes to the bridge with his sword. 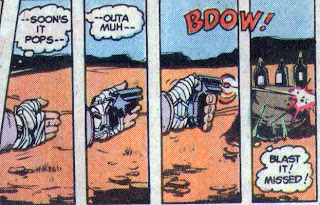 With all of his men dead in the canyon, Papagayo pulls a pistol on Hex and is about to shoot him when Estrellita stabs Papagayo in the back, killing him. She tells Hex that he always treated her like dirt and now she and Hex can take the gold and be together. Suddenly Estrellita falls from a gunshot in the back. Papagayo manages to choke out "Puta" before he dies. Estrellita and Papagayo are both dead and it starts to rain. Jonah starts to get on a horse and find some cover when he notices that the gold is running off of the bars. They turn out to be nothing but lead ingots covered in cheap paint. Jonah rides off, swearing to start doing something simple, like running a general store. In the epilogue Col. Sanchez arrives in Mexico City with the gold shipment delivered to President Diaz. Diaz commends Sanchez of his brilliant plan to hire Hex to guard a fake shipment while the real shipment was sent out three days earlier by a different route. Diaz says that they must write a note of thanks to Hex for his work. Men killed by Hex - It's hard to tell in all the gunfire so I won't even guess. Ok, I'll guess, let's say 10. This was a much better story that the prior part lead one to believe. The double crossing, the Lopez art, the huge battles, the Lopez art, the trickery at every turn, the Lopez art. The only thing that could have made it better would have been....more Lopez art. Honestly, the man's artwork is cinematic in quality. I think they could have gotten rid of the whole ugly Pablo mess and made this an extra long story or something. Next Issue: Tricky card playing, Annie Wilkes' brother, and the return of Joanna Mosby!!!! Weird Western Tales #13 "The Killer's Last Wish!" The story starts off with Jonah gunning down an unknown man. 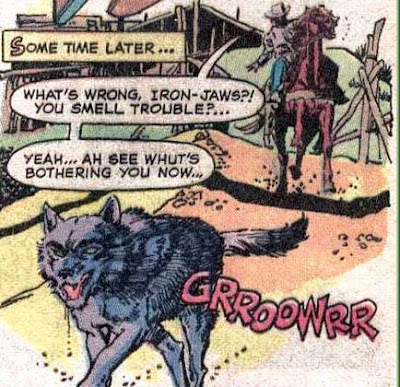 Jonah is riding across the desert followed by his wolf, Iron-Jaws. Jonah loads up the corpse on his horse and continues riding on. Later he comes upon a small shack and gets fired upon from a covered wagon. Jonah returns fire and shouts out that the gunman has just two seconds before Jonah shoots him dead. The gunman is an old man who suddenly recognizes Jonah's voice. The old man jumps out of his hiding place and shouts that he is Windy Taylor, the man who taught Jonah how to shoot. Later while they are visting, we learn that Windy had requested that Jonah come to Windy' ranch. Jonah shows Windy the corpse on Jonah's horse and asks if Windy recognizes him. Windy verifies that the dead man is one of the men trying to run him off his ranch. Jonah starts to bury the corpse but Windy points him over to three other graves, buddies of the dead man, and who all work for a man named Fenwick. After the man is buried, Jonah and Windy are eating supper. Suddenly they hear gunfire and when they run outside there are several men on horses riding away. They have shot & killed all of Windy's cattle. Jonah saddles up & takes off after the men and tells Windy to tie up Iron-Jaws. Windy shouts back that all he really wanted Jonah to do was help straighten out Windy's son. Meanwhile in town, Fenwick greets the men who shot the cattle. Fenwick offers the men some sherry but they are wanting to get paid and get gone. 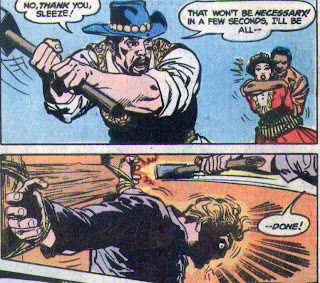 They tell Fenwick that Windy has hired Jonah Hex and Hex has already killed the fella that was supposed to bushwhack Jonah. Fenwick states that he has no idea who Hex is. Later that evening, these two men, Will & Boone, are riding far out of town. They discuss if Hex will hunt them down for killing the cattle. They decide that they are far enough away from town to camp for the night. Will starts telling stories about Hex, about how Hex is immortal and can cast spells. The other man, Boone, leaves to gather firewood. A few minutes later, Will hears a sound and thinks he hears a wild steer. He fires at it and then discovers that he has shot & killed Boone coming back with an armload of firewood. Will is shouting at Boone, telling him he is sorry for shooting him. Just then we hear Jonah tell Will that Boone can't hear anything. Will panics and start running through the underbrush, yelling that Hex won't catch him. Will suddenly falls off a cliff, screaming all the way down. Back at Windy's ranch, Windy fires at an unknown rider coming towards his ranch. The man dismounts and shouts that he is Tod, Windy's son. Windy says that he is surprised Tod is back since they had that big arguement last week. Tod has come back only to pack, he is sick of being treated like a stepson. Tod says that he is heading east but he will be needing a lot of money to get started. When Windy's back is turned, Tod pulls a pistol and shoots Windy in the back. As Windy falls a large wad of cash goes airborne in the cabin. Windy gasps that he was going to give Tod the money to start over. Tod starts ranting, saying that he had asked for the money a hundred times before, but Windy had always refused. That is why Tod had to make a deal with Fenwick to kill Windy for $500. Tod leaves the cabin and we see Iron-Jaws lunging against the chain that is holding him. Tod rides into town to meet Fenwick & get his money. 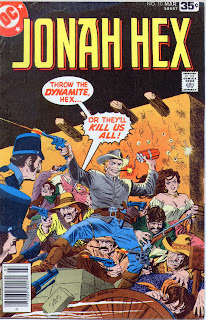 Fenwick offers him more cash if Tod will find and kill Jonah Hex. Tod says that Fenwick probably has about a thousand dollars in his office so Tod shoots & kills Fenwick and then steals the money. Tod rides out of town and several miles later he gets ready to bed down for the night. He keeps having this odd feeling that he has been followed. He imagines that shadows are shaped like men. 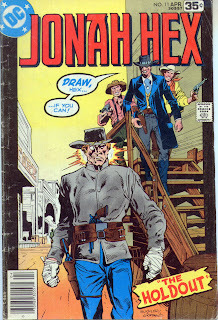 Slowly one of the shadows takes shape until it appears to be Jonah Hex and Iron-Jaws. Tod demands to know who he is going to kill. Jonah tells Tod his name and that he is tracking the killer of his friend. And that trail leads east. Tod admits that he is heading east, and he'll continue to head east after he has killed Hex. Tod draws and as he is about to pull the trigger, Jonah's bullet strikes him in the chest. Tod staggers several steps, eastward, and then collapses in a nearby creek. The next morning, Jonah is riding out of town. Several townsfolk comment on Jonah bringing in two bodies and requesting that Windy will be buried on his ranch but that Tod's body will be shipped east. Timeline - This takes place prior to Iron-Jaws death in the next issue, which I've placed around 1867. Oddly, Jonah has his Confederate hat, but not the black one he had been sporting. 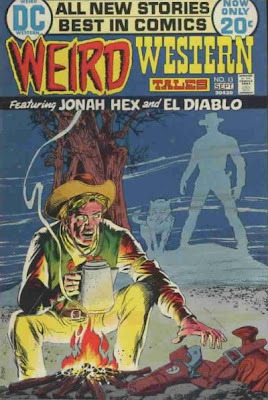 This early story from Albano keeps the mystical superstitious stories surrounding Hex. 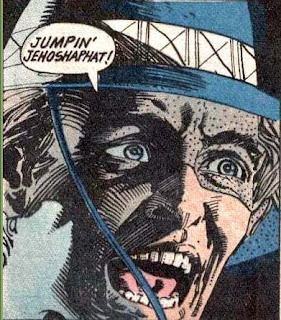 The later Fleisher stories dropped this in favor of characterization. Was the change for the better? I think to get the character started it was a wonderful way to build mystery and build readership but I think that the current series that DC is publishing is striking a good balance between the two types of Hex. There are times I enjoy these older stories, other times I enjoy the later stories. Next Issue: A stakeout, rabies, killer cats and bodies left to rot.